Baggage Check develops, installs, operates and supports vending solutions that enhance the airport environment. The Baggage Check Weighing Machines are ideally suited to the airport environment and provide a valued service to passengers. 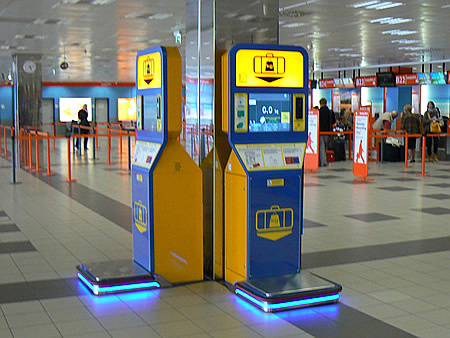 The machines reduce check in counter delays for passengers and airlines while generating extra revenues for the airport. Tourists and other occasional passengers are most likely to arrive at the airport with little idea of how much their baggage weighs and how it relates to their allowances. With frequent queues to check in, these passengers can suffer significant anxiety and, if their bags are overweight, can tie up check in staff while arguing over the need for excess baggage charges or moving belongings out of their bags. Our services are designed specifically for the airport environment; supporting multiple languages and working to airport standards. Our Baggage Check Weighing Machines provide free information on airline baggage allowances and excess baggage charges and are tailored to the airport terminal and displays the weight of the passenger’s baggage on a pay per weigh basis. The Baggage Check Weighing Machine is specifically designed for the airport environment. At 2m tall, with a footprint of less than 1m2 and a touch screen control, it is styled to fit well into an airport and to attract passengers. 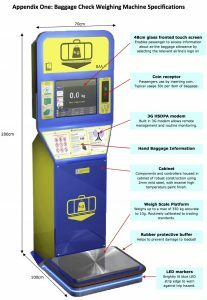 The front of the machine is used to display simple instructions as well as providing security information on hand baggage regulations. The touch screen display is customised for each airport terminal to display the airline selection buttons in priority order and passengers can choose from over 20 languages. The weight of the bag is displayed in the centre of the screen. 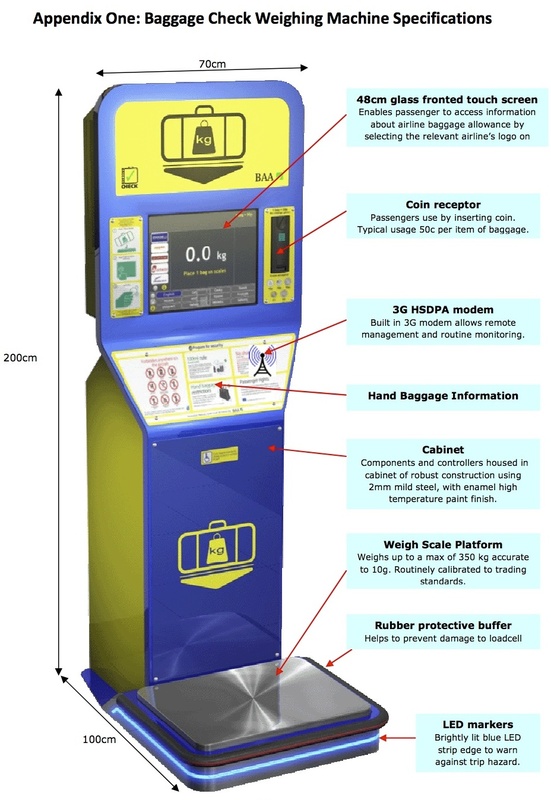 This is displayed as “0.0kg” before the bag is weighed to communicate to passengers as they approach that this is a weighing machine. As soon as the passenger puts their bag on the scale and inserts £1 (€1 in Euro zone countries) the bag weight is displayed. The coin receptor is programmed to accept 10p, 20p, 50p, £1 or £2 coins (50c, €1, €2 in Euro zone countries). No change is given but multiple bag weighs are permitted up to the value of coins inserted . Over a year of work has been invested into developing the machines. Initial concept trials were conducted in Germany with a basic machine and, based on the trial results, a production model was developed. 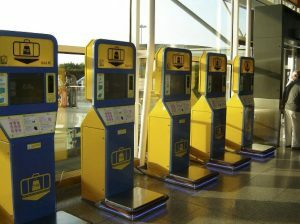 Five production model machines were installed in London Stansted Airport on 17th March 2009, three were placed in the Security Repack Area with the remainder in the check in zones. The machines worked well, with passengers using the machines intuitively. Over the first two months approximately one bag was weighed for every 25 outgoing passengers. The number of machines was increased to nine within the first three months with the extra machines all located close to the check in counters. Machines are now being deployed in other UK airports and the service is also operating successfully in three German airports (Frankfurt Hahn, Berlin Schönefeld and Lubeck). 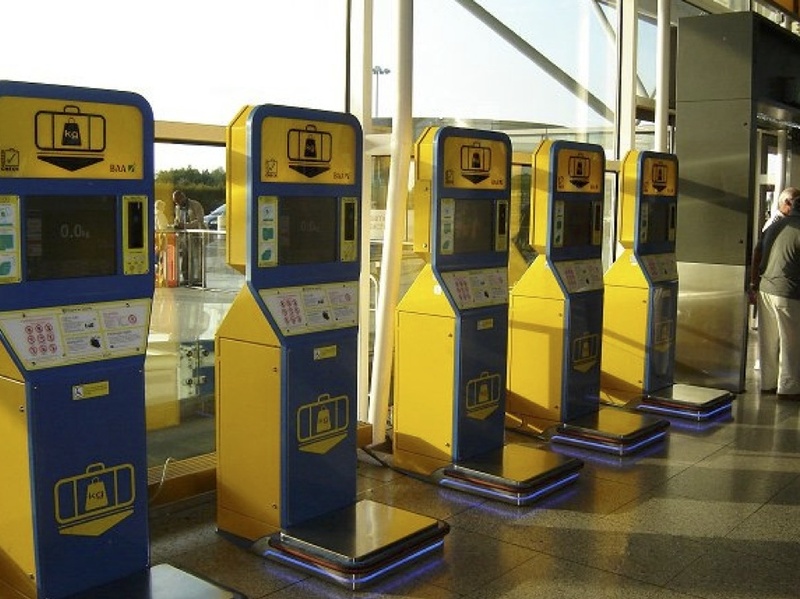 The machines are supplied and supported by Baggage Check Limited at no cost to the airport. The machine locations are determined through discussion with the airport, to maximise revenue and to ensure they fit with the flow of passengers through the airport. The machines have proved highly reliable and are monitored remotely through a 3G mobile broadband connection, most maintenance can be performed remotely. The support team is committed to a 24 hour response for on-site maintenance. The airport would be responsible for providing a suitable electrical supply (the machines require a standard 240 volt supply, draw less than 6 amps on start up, and less than 1 amp during normal use). The weigh scales are supplied and calibrated by Avery Weigh-Tronix, a leading international supplier to the aviation industry, to match the calibration of international standard check in counter scales. The machine carries the statement that it is for guidance purpose only to avoid any confusion with check in counter scales.